High on the hill there was a lonely goat herd — and then a plane whizzed by overhead and interrupted that solitary reverie with a roar of jet engines. That’ll be the scene at Chicago’s O’Hare International Airport, when the city brings in a herd of 25 goats onto the property to get their grub on, effectively acting as sustainable lawnmowers. The plan is to bring the goats in on a loan from a company that owns a local restaurant to help the airport kick off its new vegetation-management program, reports the Chicago Tribune. One of the restaurant’s partners tells the paper that they originally bought the goats on a whim, thinking perhaps there’d be room on the menu for goat burgers. But as it turns out, they’re “the perfect lawn mowers,” he says, especially to help trim back unruly brush and vegetation in hard to reach and rocky areas of the airport. 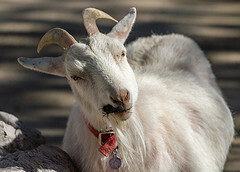 The goats will be expected to clear about 250 square feet of grassy grub per day, particularly on the hilly areas near creeks and streams, and roadways currently covered with thick brush. And just like those goats hanging out high on the hill with the lonely goat herd, these four-legged mowers will have a keeper on hand to make sure they’re chowing down where they’re supposed to — with fences in place to keep them off runways. Lest you’re afraid these guys will get turned into burgers when their job is done, rest easy — the goats will go back to the farm they’re currently living on until next spring, when they’ll come back to work at the airport. Apologies if songs from the Sound of Music are also stuck in your head now. It had to be done.